By default, you can add a clickable hyperlink to a webpage / website on slides of your PowerPoint slideshow presentation. 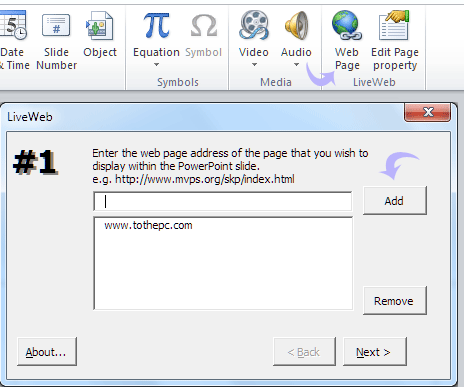 Do you want to add and insert actual live webpages on PowerPoint show? You can easily do this using free ‘Live Web’ PowerPoint addon. 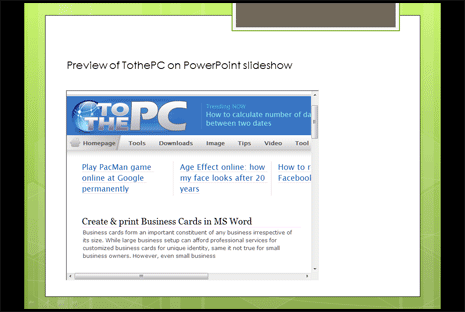 It allows you to display live webpages within customizable box on PowerPoint slide. 1. Open LiveWeb addon download page. Click to download addon for PowerPoint 2007 / 2010 users. Click Save button to download addon file to downloads folder (make sure you note the location of folder where addon files have been extracted). 2. Now launch PowerPoint program on your computer. Then goto File > Options. 3. 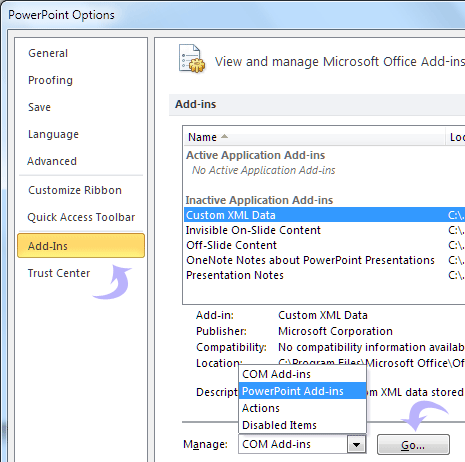 In the PowerPoint options dialog box, click ‘Add-ins’ tab on the left sidebar. 4. At the bottom of this dialog box, select ‘PowerPoint add-ins’ from drop down box next to ‘manage’ and then click on GO button. 5. In the next ‘add-in’ dialog box, click ‘add new’ button. 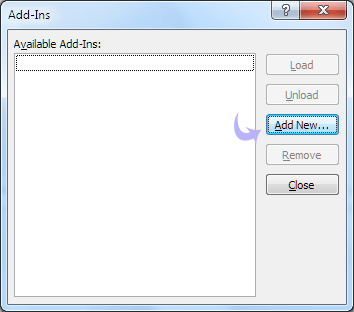 Then browse to select liveweb addon file from the folder where it was extracted after the download. 6. After selecting Live Web addon file, you will get a pop-up dialog box. Click ‘enable macros’ on that dialog box. This will successfully install Live Web addon in the PowerPoint program. 7. Now click ‘Insert’ tab to view new ‘Live Web’ option. Click ‘web page’ button on ‘Live Web’ option. 8. In the pop-up dialog box type or enter URL of the webpage that you want to display live in the PowerPoint presentation slideshow. Click ‘Add’ button and then click ‘next’ button. 9. On the next dialog box, option to refresh inserted webpage automatically is already checked. You may uncheck it, if you do not want to display updated webpage in the PowerPoint slideshow. 10. Then click ‘Next’ button to configure option for webpage size and position orientation on the PowerPoint slide. Then click ‘Finish’ button. 11. To preview inserted webpage, goto ‘Slideshow’ tab and click ‘From beginning’ button. You can view live webpage on the slide of your PowerPoint slideshow presentation. Similarly, you can add and insert multiple webpages on different slides of PowerPoint show.